Israeli settlers assaulted Palestinian farmers, in the Masafer Yatta area of the southern West Bank district of Hebron, on Wednesday, and attempted to seize their lands. 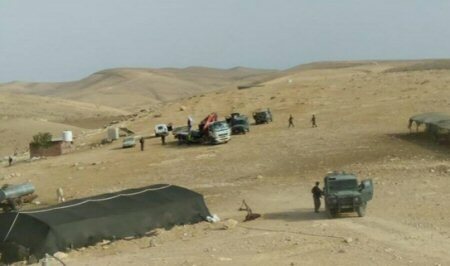 Rateb al-Jbour, coordinator of the National and Popular Committee in southern Hebron said that Israeli settlers assaulted several Palestinian farmers in Masafer Yatta, according to Ma’an. The farmers sustained multiple bruises across their bodies, while Israeli settlers also attempted to damage several dunams of Palestinian lands planted with winter crops. Around 3,000 Israeli settlers live in illegal Jewish-only settlements in the Yatta region, according to the Applied Research Institute of Jerusalem. Masafer Yatta residents were expelled at the time of the establishment of a firing zone, in the 1970s, and were eventually allowed back, following a long court battle, but are now under the constant threat of being expelled or seeing their homes demolished.